Sharon Musgrave’s career shot to prominence in the 90's. She left Canada for the UK, where she was born, to pursue a career in music. She achieved international chart status with her hit Fascinating Rhythm on (Virgin Records) a song she wrote and performed with William Orbit. Then she was asked by Warner Brothers UK to work with jazz pianist Julian Joseph on his album The Language of Truth. 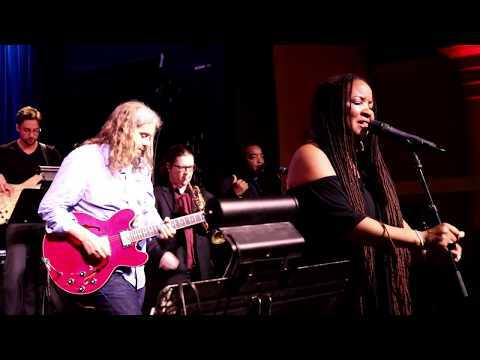 Sharon performed Curtis Mayfield's soul classic, The Other Side of Town. After a career of touring all parts of the world, Singing in Commercials and constantly honing in on her writing abilities, she returned to Canada to settle down. But her calling for creativity and performance brought her back to the stage to produced her first solo album project “Selah” in Canada. The video for this release shot up to the top 20, on Canada’s Bravo Video chart count down. She performed throughout Canada after making a debut performance at the TD Jazz Festival at Harbourfront Center in Toronto. In 2003 a dance track she wrote and performed on with Ear to Eye Productions, entitled "Nobody" was released on Timewarp in Europe. The song was then singled out for "Ibiza Lounge-3", a compilation which included Nora Jones and Coldplay. In 2009, UK producer Steve Miller of After Life, asked her to appear on his album project, “Electrosensitive”. She wrote and performed "Fantasy," The dance track, was released on (Defected records). It was also included on the (Hedkandi) Beach House 2009 compilation album. Musgrave moved on to her second Solo project "Outflow" years later. It was co-produced with engineer, producer Peter Grimmer, plus remixes from international DJ producers. The DJ remixes influenced Sharon to embark on her first deephouse EDM album project entitled, “Get Down Wit Cha,” a collaboration with European producer DJ Thor, featuring house, chill and lounge mixes. 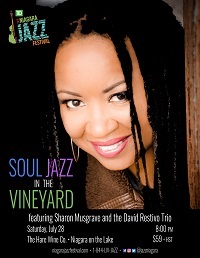 All affirms Sharon’s song writing and vocal prowess as a jazzy, soulful, funk, hiphop, dance fusion goddess. Her discography is available in most online stores. Sharon, however has all hard discs on sale at her company website zosar.com, you can also mail order at DustyGroove.com. “Sha’s Archives” is approachable, inventive and flavorsome with a personality all of it’s own. Each song has it’s journey and each journey has a peace of Sharon. The genre is soul with all it’s affiliates.